The Colombo Plan Staff College for Technician Education (CPSC) in collaboration with the Ministry of Education (MOE), Myanmar organized the In-country Program on “Industry - Academia Collaboration & Partnership” on May 7 -11, 2018 at the Office of the Department of Technical and Vocational Education and Training (DTVET) in Yangon, Myanmar. Dr. Ramhari Lamichhane, Director-General of CPSC supervised the overall program implementation and contributed as a resource person along with Dr. Nay Myo Tun, Deputy Director General of DTVET. Dr. Rajesh Khambayat, Former CPSC Faculty Consultant and the current Joint Director of PSS Central Institute of Vocational Education, Bhopal, India; is coordinating the program and also contributed as Resource Person. Dr. Zaw Min Naing and Mr. Zaw Lin Htun, of DTVET, facilitated as local coordinators for the program. The one-week program was formally inaugurated on May 07, 2018 by Honorable Dr. Aye Myint, Director General of DTVET who welcomed all delegates in behalf of the MOE namely: Dr. Lamichhane, Dr. Khambayat, senior officials from MOE, participants and other invited guests from all over the country. 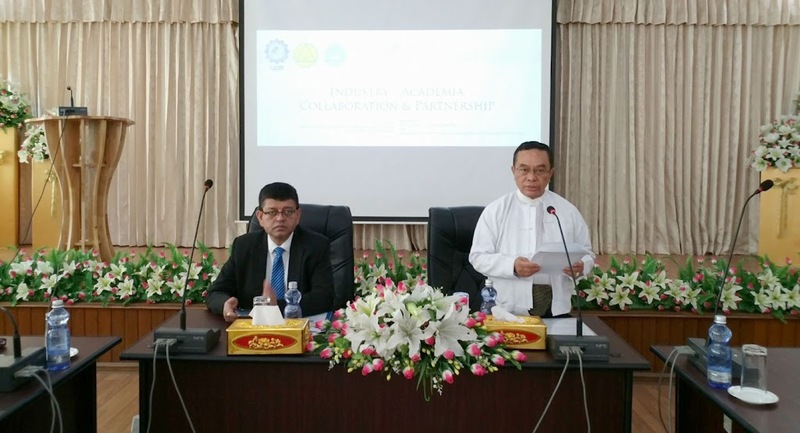 In his welcome address, Dr. Aye Myint congratulated the role of CPSC in strengthening industry-academia linkages for developing the next generation workforce through TVET in the region and more particularly in the perspective of Myanmar. He further stressed that it is imperative to enhance the competitive advantage of the industry in order to realize the economic growth of each nations. In all developed countries, industry-academia collaboration & partnership (IACP) has played an important role to enhance the competitive advantage in the industry sector. It is essential for TVET institutions to be exposed to actual industrial environments to develop and enhance their skills. In response, the Dr. Lamichhane highlighted the need for partnership and collaboration among TVET institutions and industry. He thanked and appreciated the efforts of MOE for collaborating and inviting CPSC to organize the capacity building training program for TVET administrators and managers. He stressed that there is a growing need for the TVET system to address industry requirements through offering demand-driven programs in the near future. 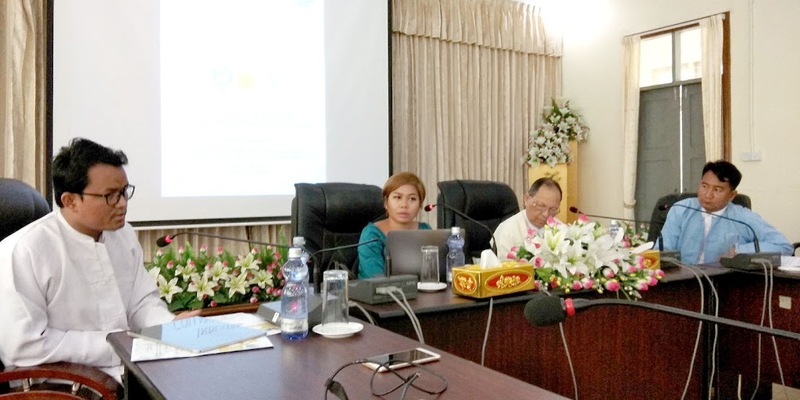 Meanwhile, Dr. Khambayat mentioned the significance of the in-country program as a valuable collaborative event, which the Myanmar Government, through MOE, has successfully organized. He expressed great appreciation to Myanmar for making possible the model of involving all TVET stakeholders’ partnership in the program implementation. Further, he called for the business and industry, universities and polytechnics to create a greater synergy by expanding their connections for preparing the workforce for Industry 4.0 during the inaugural program. 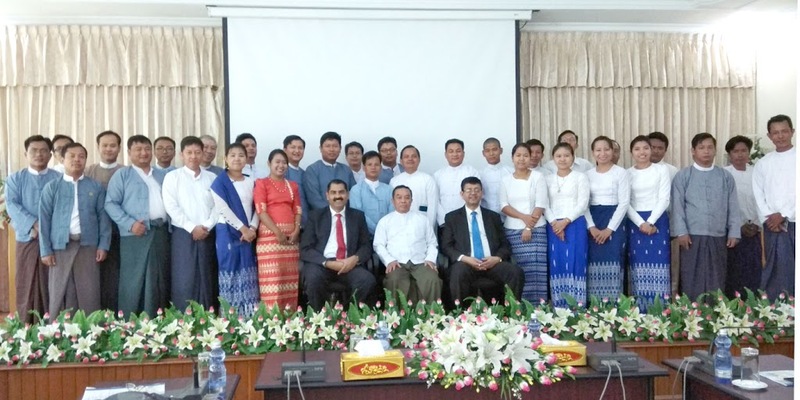 The program was attended by 22 TVET administers, senior teachers, from various TVET schools and industry professionals from private organization spread across Myanmar. It targeted to usher TVET institutions and private organizations represented to their journey towards developing competent workforce for meeting the emerging challenges of human resources in the TVET sector. The program also strived to equip the participants with the working knowledge of industry-academia partnership and how it can be applied in TVET institutions. National Seminar on Quality Assurance aims to provide a platform to discuss TVET quality systems in Myanmar. Another highlight of the program is the one-day National seminar on Quality Assurance in TVET: Emerging Challenges and Fresh Perspectives held on 08 May 2018. The purpose of the seminar was to create a platform for academicians and practitioners to exchange research-based and experience based insights on issues, addressing the radiant transitions in the TVET system in the context of Myanmar. The seminar was facilitated by seven TVET experts and industry representatives through three plenary sessions such as: a) Quality Assurance in TVET; b) Building Quality Culture in TVET Institutions; and c) New Initiatives and Best Practices on Quality Assurance in TVET. The expected seminar outputs included a set of recommendations for further actions, sharing of best practices in quality management in TVET system and networking among partner institutions and participants. The seminar program was attended by Senior Officials of Department of Education, MOE and DTVET, senior industry executives and about 60 TVET policy makers, faculty members, Directors and Administrators from various TVET institutions from all over Myanmar. Industry professionals and officials from private organization and media representatives from different places also took part in the event. The seminar was opened by Dr. Lamichhane and Dr. Nay Myo Tun, Deputy Director General of DTVET. The event also invited some of the esteemed officials from the field of TVET Quality Assurance namely: Daw New Ni Wai (Executive Director of UPG Co., Ltd.) who discussed a case study on agile quality assurance strategy; Dr. Kyaw Khaing Khaing Aung (Director of TVET) who elaborated on quality assurance in teaching and Daw Thi Thi Pyone (DTVET Deputy Director) who discussed quality TVET education in Myanmar. Papers on Quality Excellence through APACC accreditation and Industry Institution Linkages were presented by Dr, Lamichhane and Dr. Khambayat, respectively. The program also included a panel discussion on “Developing Industry-Academia & Government Collaboration: a Game Changer for 21st Century Workforce Development” which was held on 10 May 2018. On the same day, a local institution in Yangon was also visited to highlight the benefits of industry-academia collaboration. Dr. Aye Myint (right), the Director General of DTVET, delivering his opening address. Dr. Lamichhane (left) and Dr. khambayat (right) delivering their respective presentations. Some of the invited guests from Myanmar’s TVET sector and industry partners sharing their insights during the National Seminar.